Vineyard Vines, YouTubeEveryone is smiling! These clothes are fun! To shake that image, there are clubs that are supposed to support inclusiveness among minorities already working at banks, and initiatives to recruit underrepresented people from different walks of life. But sometimes, banks are a little tone deaf as to how to make themselves seem open to people who are different from the traditional Wall Streeter. It’s been a two-little-steps-forward-one-gigantic-step-back kind of movement. And at this moment, I can say confidently that JP Morgan just took a step in the wrong direction — in fact, it’s an embarrassing direction. Here’s what happened: The bank recently announced that it would move to a business casual dress code. On the one hand this is obviously great for people who want to work in a less stuffy work environment. On the other hand it can be a confusing designation. What is business casual exactly? Well, JP Morgan has decided to help its employees figure that out by setting up a Vineyard Vines pop up store at its New York headquarters for the completely, utterly, miserably, tragically confused adults who don’t know how to buy a pair of decently fitting khakis. Apparently this is just in case all you have in your wardrobe aside from suits is a bunch of old Grateful Dead tee shirts from your “experimental” phase at Wesleyan. “…that may only be the start of a broader apparel push at the biggest U.S. bank by assets. J.P. Morgan is slated to open pop-up shops at its New York, Wilmington, Del., and Columbus, Ohio, locations later this year, said Chief Marketing Officer Kristin Lemkau. Let me break it down for you: Vineyard Vines is the brand that puts grown men in whale patterned pants. You can get crabs too, if you’re lucky. It also aggressively uses pink and green as a legitimate colour combination for men and women who are legally allowed to drive and vote. If you want to picture someone in them, picture Greg Marmalard and his fellow Delta Tau Chis in Animal House. Picture Carlton Banks. Do you want to dress like Carlton Banks? The Fresh Prince sure didn’t. Vineyard Vines, YoutubeHere’s to you bro-sef. 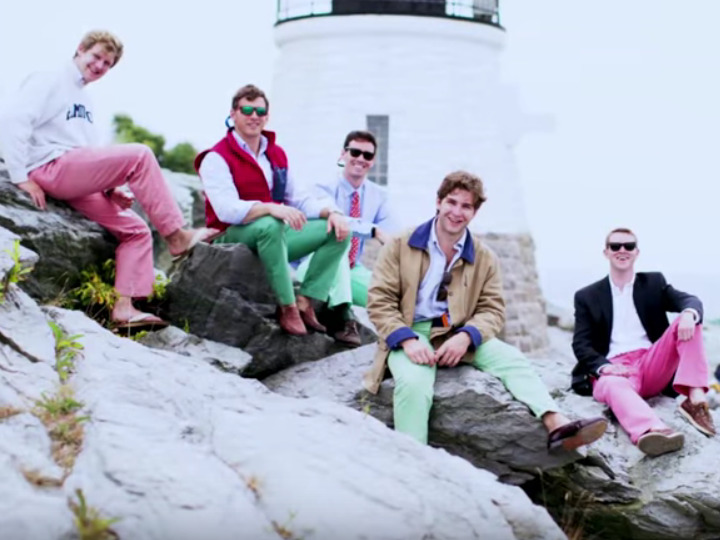 But what’s more important than any of that bad taste, is that Vineyard Vines is for people who all want to look the same — obnoxious pastel coloured drones. And that penchant for uniformity is the very reputation Wall Street is trying to battle. If JP Morgan is telling its employees that this style is “appropriate” for work, then it’s telling its employees (whoever they are and wherever they’re from) that this is the kind of lifestyle they should emulate at work. It’s telling them that the bank isn’t changing with its workforce, it’s telling its workforce to bow down to the awkward tradition of who runs the bank. But whatever, can’t wait to see you bros drinking at Snafu in your Vineyard Vines JP Morgan ties. Oh, and did I mention that Vineyard Vines is a JP Morgan client? Well it is.